Tiers in South Tyrol is not only a paradise with respect to the wonderfully snowy winter landscape, but also with regard to the possibilities of active winter holidays in the Dolomites. Just 15 minutes from Tiers you find Carezza ski area in the Egg valley, which is the most sunny ski resort in South Tyrol. On the 40 km of slopes, you can enjoy full throttle and admire the magnificent view of the kingdom of King Laurin. 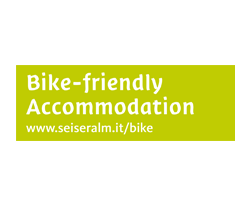 Also close to Tiers, about 30 minutes away, the Seiser Alm ski area and the ski resorts in the Fassa valley offer even more variety. Modern ski lifts, cool snow parks and snow-safe slopes guarantee you eventful days in the snow. If you would like to get away from the well – visited slopes, a ski tour offers the suitable opportunity. 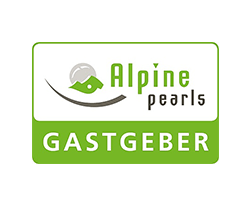 From Tiers you can go to the Bergler hut, the Grasleitenpass hut and theHanickerschweige. 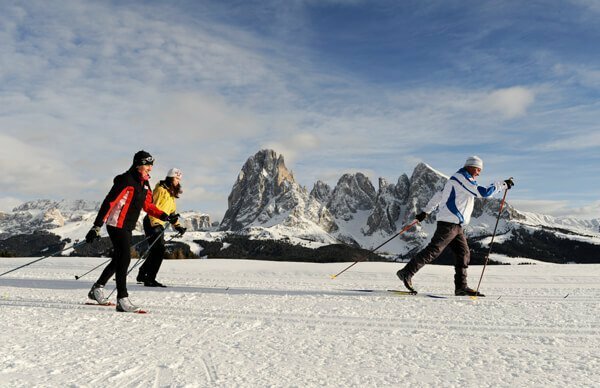 In the ski resorts Carezza, Latemar and Seiser Alm, cross-country ski runs also invite you to discover the untouched nature in the winter holidays and to be enchanted by the white glittering landscape. What can you still experience during the winter holidays in Tiers? An excursion to the toboggan run is the ideal opportunity to spend time in the winter holidays with the whole family and have fun. Borrow sleds and enjoy the driving! On the toboggan runs Carezza and Tuff Alm you can go down wide and well-groomed meadows and let the fresh wind whirl around your ears. The 2,1 km-long natural cycle track at the Völs Lake is a recommendation worth. After the descent from the Tuff Alm to the lake, you will first find a refreshment in the stube and you can then rent skates and spin pirouettes on the frozen lake. Ice skating, curling and ice hockey can be played at the Kantun ice rink in Tiers in South Tyrol, which is open from Christmas to Easter every afternoon. Winter hikes and snowshoe hikes also belong to the program of every winter trip. From Tiers, a beautiful winter hiking trail leads you to Messnerjoch. An alternative is the middle-rate winter hike on the Wintersagenweg. Deeper into the untouched nature, you can go on a snowshoe hike: head towards the Wolfsgrube and the Niger Pass or cross the so called Bärenfalle on a challenging snowshoe hike and master the Knüppelweg. No matter what you choose: Tiers and the Egg valley offer numerous possibilities to spend an active and varied winter holiday in the Dolomites! A snowshoe hike in the Dolomites is a wonderful opportunity to discover the mountains, to experience silence and to gather new impressions. Since Tiers is one of the most popular and beautiful snowshoe hiking area in the whole of South Tyrol, there are numerous hiking trails. 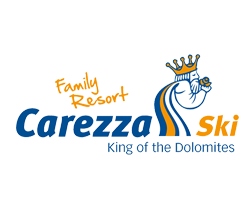 In the Carezza ski resort you can rent snowshoes and go on a discovery tour. From the parking lot Weisslahnbad follow the mark 6 to the west into the Steig valley, keep left till you reach the Patisserhof and finally turn right on the path 4B to the St. Sebastian Chapel. At the fork, turn right again and take path 4 past Wuhnleger back to the starting point. A circular hike from Weisslahnbad leads you through deserted landscapes to the Tschafon hut and back. Follow the sign 6 into the Steig valley, then turn right and take the path no. 4A to Wuhnleger. Once there, turn right again and follow the path to the Tschafon hut (1733 m). Take the same route back to Weisslahnbad. From the Hotel Zyprianerhof in St. Zyprian you walk to the Traunwiesen and continue on the forest road to the entrance of the Tschamin valley (1380 m). At the source Schwarzer Lettn you walk a narrow path to the cottage Schaferleger. Follow the path uphill to the right and enjoy the view of the Grasleiten towers and Tschamin peaks. Back to St. Zyprian you can either take the forest road through the Tschamin forest to the right of the Tschamin brook or, with good snow conditions, go on the Tschaminschwaige. Above Völser Aicha, the hike begins at the Gasthof Schönblick in St. Kathrein and takes you along the paths 7 and 7A through a spruce forest. At the crossroads, take route no. 4 to Tschafon hut, where you turn right on path no. 9 and walk up to the Völsegg peak (1834 m), where you can enjoy an unforgettable view from the Rosengarten to the Eisack valley. Walk back to the hut and take path no. 4 through the mountain pine forest to Wuhnleger. After this, keep to the right and walk in the direction of Völsegg on the 4A marked path. The trail 6, starting at the wayside cross, called Völsegger Bild, takes you back to St. Kathrein. Walk from the Hotel Zyprianerhof in St. Zyprian to the hamlet of Gemeier, over the wooden bridge and continue in the direction of Zefaller Hof on path M5 through the forest. Passing by the Sattel, which separates the Tiers from the Egg valley, you come to the Wolfsgrube and continue your way to the Schillerhof, where you can take a break. On route n ° 1, continue towards Rosengarten to the Niger Pass. On route 1, you will come back from the Niger Pass to the Tiers Valley and St. Zyprian. From the fountain square in Tiers this route takes you to St. Zyprian via Völsegg, passing by the Wuhnleger and Weisslahnbad. Each station waits with a suitcase with story books, where you can enjoy a break. From the Pröslerhof you will walk up to the Schlern brook near Ums, to the Falzunwiese and finally to the Mongaduier Sattel (1880 m). From there you take the road to the Schnaggenkreuz and through forests and meadows you return to Prösels. From Vitalpina hiking hotel Zyprianerhof, take path 7 to the Tiers brook, turn right and follow Route 1A to the Niger Pass. Here you cross the road and follow the forest trail to the Messnerjoch hut. When you return to the Niger Pass, you can take the ski bus to St. Zyprian. Cross-country skiing is one of the most popular winter sports in South Tyrol. There is a wide selection of cross-country ski runs in different difficulty levels. Cross-country skiing is not only funny and takes you on well groomed trails through the enchanting winter landscape, but also has a positive effect on your health. During cross-country skiing, almost all muscle groups are evenly stressed and endurance is strengthened. 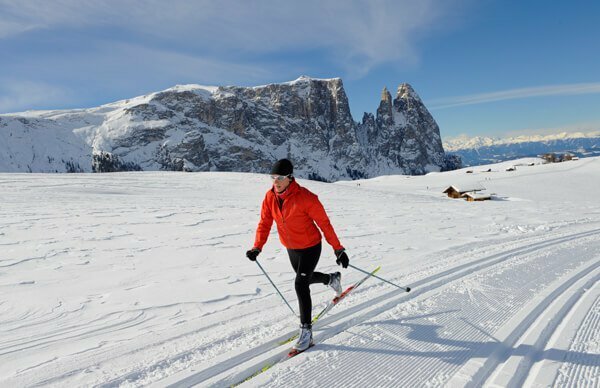 In your cross-country skiing holiday in South Tyrol, you benefit from the cross-country skiing offer of the Carezza ski area. Here especially beginners get their money’s worth, since it’s all about easy cross-country ski runs with easy slopes. The round trip Carezza Lake (Angerle Alm) with 3 km is ideal for beginners who would like to get to know this sport for the first time. The next cross-country ski experience can already take place on the 5-km-long round course Fin, while the highlight is the connection track Frin-Niger-Frin with 8 km. On all the described trails, you can enjoy bright sunshine and a wonderful panoramic view of the Rosengarten. On the Seiser Alm the cross-country skiing continues and has much more to offer. The 14 double-to-fourfold groomed cross-country trails cover a total of 80 km and offer beginners and cross-country skiers the right challenge. On the practice trail at the Ritsch cross-country ski center, you can warm up to 2.1 km. The connection track Sonne is also suitable for beginners with its small difference in height and the length of 3,2 km. A sporting challenge and a great view of Langkofel, Plattkofel and Schlern offers the 11,3 km long cross-country ski run Panorama at the cross-country ski center in Ritsch. The Jochloipe is finally the longest and most demanding cross-country ski run on the Seiser Alm. This cross-country ski run takes you from the cross-country ski center Ritsch over wide alpine pastures and then climbs to the top station of the Panorama chairlift. On the way you have a great view of the imposing peaks of the Dolomites, such as the Rosszähne and the Schlern. If you want to spend an Advent holiday in South Tyrol, you should definitely visit the beautiful South Tyrolean Christmas markets. Every year the markets are lovingly built and decorated. Farmers offer regional products and specialties, craftsmen present traditional carvings, and the smell of roasted almonds and mulled wine is everywhere in the air. In addition there are the romantic lighting and the moody music. Our secret tip for you is the Christmas market at the Carezza Lake in Welschnofen. This small and well-structured traditional market offers peace and quiet with its ten wooden huts and allows you to experience Advent in its original form. Taste dry fruits and cheese and marvel at the Dolomite-inspired sculptures of snow and ice. A holiday in Advent is also a time trip back to your childhood, in which you went with your parents to a Christmas market and you could no longer come out from astonishment. Can you remember how happy you were before the beginning of the Christmas feast? Get this feeling back into the present and give your children the opportunity to experience Advent in such a special way. The traditional Christmas market in Kastelruth, which is one of the most beautiful in South Tyrol, is just around 28 km from Tiers. 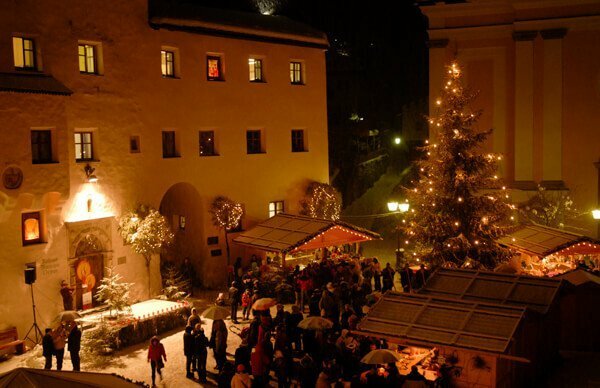 During the Kastelruther Bergweihnacht (alpine Christmas), there is a genuine Christmas atmosphere. It is about practicing contemplation and tradition. Hectic and stress remain outside, instead, people get closer together and celebrate the approaching feast of love. 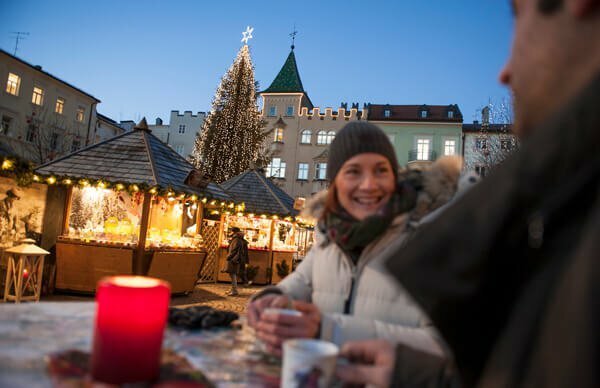 Stroll comfortably over the market square on the historic village square and enjoy lanterns and lights, authentic South Tyrolean music and a wide range of events. Take the opportunity to choose individual and very personal Christmas gifts for your loved ones: from self-knit wool socks to candles, from local craftsmanship to delicious mountain tea and honey, you will find many special features here. Take a break and order a mulled wine, taste gingerbread and other traditional specialties. 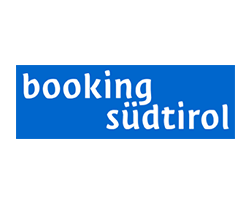 Another special feature is the varied program of the Kastelruther Bergweihnacht (alpine Christmas), the highlight of which is the Christmas concert of the Kastelruther Spatzen. The Christkindlmarkt in Bozen is also worth a recommendation. This market is the largest and most famous Christmas market in Italy! The splendidly decorated Walther square of the provincial capital of South Tyrol is surrounded by a special flair in Advent that you can enjoy. In Brixen, too, the Dom cathedral in the Advent time has got a unique seductive glow that you can enjoy not only on the Christmas market but also during a wintery carriage ride. 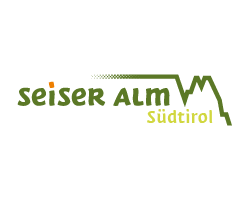 With the Seiser Alm Live Card, which you receive as our guest, you can drive free of charge to the Christmas markets in Bozen, Brixen, Meran and Sterzing, thus doing a real Advent tour!